Definition at line 12 of file CREStringListPanel.h. 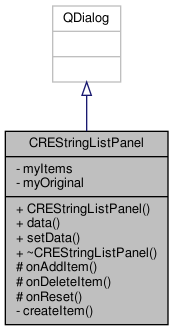 Definition at line 4 of file CREStringListPanel.cpp. References myCurrentLine, myItems, myTextEdit, onAddItem(), onCurrentItemChanged(), onDeleteItem(), and onTextEditChanged(). Definition at line 29 of file CREStringListPanel.cpp. Definition at line 33 of file CREStringListPanel.cpp. Definition at line 73 of file CREStringListPanel.cpp. References dataModified(), myCurrentLine, myItems, and myTextEdit. Referenced by commitData(), onAddItem(), onDeleteItem(), and onTextEditChanged(). Definition at line 47 of file CREStringListPanel.cpp. Definition at line 55 of file CREStringListPanel.cpp. Definition at line 82 of file CREStringListPanel.cpp. References commitData(), myCurrentLine, myItems, and myTextEdit. Definition at line 61 of file CREStringListPanel.cpp. Definition at line 91 of file CREStringListPanel.cpp. Definition at line 38 of file CREStringListPanel.cpp. References myCurrentLine, myItems, and myTextEdit. Definition at line 28 of file CREStringListPanel.h. Referenced by commitData(), CREStringListPanel(), onCurrentItemChanged(), onDeleteItem(), onTextEditChanged(), and setData(). Definition at line 29 of file CREStringListPanel.h. Referenced by commitData(), CREStringListPanel(), getData(), onAddItem(), onCurrentItemChanged(), onDeleteItem(), onTextEditChanged(), and setData(). Definition at line 30 of file CREStringListPanel.h.